Reservations recommended for all venues with New Year’s Packages! The evening starts with the 7pm dinner show at EGAN’S, followed by three more bands and complimentary champagne toast at midnight at LUCID. 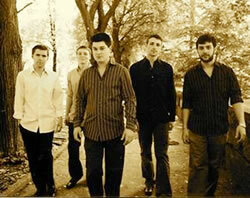 Great music at both venues throughout the evening w/complimentary champagne toast, drink specials. Come enjoy a taste of straight ahead, funk, blues, Caribbean, Afro Rhythm and more. No cover, but donations and memberships will be accepted. Consider becoming a member of the Seattle Musicians Foundation! Billy Taylor, a pianist and composer who was also an eloquent spokesman and advocate for jazz as well as a familiar presence for many years on television and radio, died on Tuesday in Manhattan. He was 89 and lived in the Riverdale area of the Bronx. The cause was heart failure, said his daughter, Kim Taylor-Thompson. Dr. Taylor probably had a higher profile on television than any other jazz musician of his generation. He had a long stint as a cultural correspondent on the CBS News program “Sunday Morning” and was the musical director of David Frost’s syndicated nighttime talk show from 1969 to 1972. KWJZ 98.9fm, Seattle’s smooth jazz station for the past 17 years, abruptly changed format yesterday becoming Click 98.9, another station that plays Adult-Contemporary/Classic Alternative music (think Coldplay and Red Hot Chili Peppers). For 19 years 98.9 KWJZ has been presenting a mix of Smooth Jazz music for you, our very loyal music fans and radio listeners. It is with sadness that we inform you that this era for 98.9 FM has come to a close. Technologies change and the new radio audience measurement is not favoring our once “ratings-strong” Smooth Jazz music format. I encourage you to continue to support the artists who make the music and the venues who bring them to the Northwest. It is with huge gratitude on behalf of the entire KWJZ staff that we thank you for being here with us for these many years. While readers of Seattle Jazz Scene might not have turned to KWJZ as their primary radio choice, the station, led by jazz radio veteran Carol Handley, has been very supportive in promoting jazz events such as the Bellevue Jazz Festival, Ballard Jazz Festival and Earshot. It will be a loss for the Seattle jazz community. The holiday concert of “Sacred Music by Duke Ellington,” will be presented at 7:30pm on Sunday, December 26th, 2010 at Town Hall Seattle (1119 Eighth Avenue, Seattle). This very special event, now celebrating its 22nd anniversary, features the all-star Seattle Repertory Jazz Orchestra with guest vocalists Everett Greene and Nichol Venee Eskridge, the 30-voice Northwest Chamber Chorus, and tap dancer Alex Dugdale. 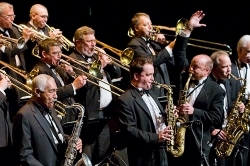 The Seattle Repertory Jazz Orchestra is directed by Ellington scholar Michael Brockman, professor of saxophone at the University of Washington, and Clarence Acox, drummer and award-winning band director at Seattle’s Garfield high school. Many of Seattle’s favorite jazz artists are to be featured, including trumpeters Jay Thomas and Thomas Marriott, pianist Randy Halberstadt, bassist Phil Sparks and many more. The SRJO’s double-album “Sacred Music of Duke Ellington” continues to be widely praised by the national media, including recognition as one of the “Best Recordings of 2006” by audiophileaudition.com. For the second time, vocalist Everett Greene, a renowned Emmy Award winning vocalist currently recording and touring with the Count Basie Orchestra, joins the cast. Returning for this year’s concert is vocalist Nichol Venee Eskridge (who is also featured on the SRJO’s Sacred Music of Duke Ellington CD), tap-dancer Alex Dugdale a graduate of Roosevelt High School, and the Northwest Chamber Chorus under the direction of Mark Kloepper. The Sacred Concerts are a long-standing holiday tradition presented by Earshot Jazz, Seattle’s nonprofit jazz organization. Tickets for the concert are $26 general admission. Discounts available for Earshot members, senior citizens and students. Tickets are available through Brown Paper Tickets or by calling 800-838-3006. More information available at www.earshot.org. JAZZ ALLEY: enjoy your holiday! BAKE’S PLACE: enjoy your holiday! CAFE RACER: enjoy your holiday! Merry Christmas from Jazz Northwest! The Christmas season continues right on through Sunday this year, and we’ll be celebrating on Jazz Northwest with some seasonal music, we’ll mark this first Winter weekend of Winter, and preview the Seattle Repertory Jazz Orchestra’s Ellington Sacred Music concert which takes place Sunday evening. New Year’s Eve is just around the corner so we’ll also fill you in on some of the best jazz spots to welcome to the New Year. We’ll have music by Jim Knapp, Dawn Clement, Thomas Marriott, The SRJO, Bobby Medina, Nancy King, Bill Smith, Clipper Anderson and Hans Teuber & Dave Peterson. Jazz Northwest airs every Sunday afternoon at 1pm PDT on 88-5, KPLU and kplu.org. 12	RANDY HALBERSTADT presents Special Guest Vocalist GAIL PETTIS. A video from The Seattle Times: Kenny Boas, who worked as a crossing guard at Kimball Elementary for 11 years, was a fixture of the 1940s Seattle jazz scene. 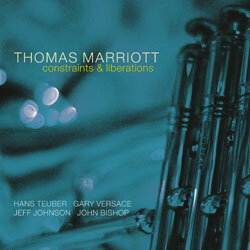 Trumpeter Thomas Marriott keeps growing as an artist. He has released CDs at a healthy pace since 2005: an introduction for many perhaps unwary jazz fans to some warped country western flavor on Crazy: The Music of Willie Nelson (Origin Records, 2008); cranking an all-star quintet up in a modern mainstream mode on Flexicon (Origin Records, 2009); and letting it rip on a two-trumpet blow fest with fellow brass man Ray Vega on East-West Trumpet Summit (Origin Records, 2010). Constraints and Liberations ups his output to two releases in 2010. Spontaneity has always been a big part of Marriott’s jazz game, but with Constraints and Liberations, it seems he has gone deeper into that mode. The set opens with his original “Diagram.” A bright splendor of two-horn harmony introduces the tune with a teaming of the leader’s open horn and Hans Teuber’s haunting tenor saxophone, leading to a shift into brass/reed conversation, with Teuber telepathically finishing Marriott’s opening statement. Here, and throughout the set, the rhythm team—pianist Gary Versace; bassist Jeff Johnson, and drummer John Bishop—maintains a low key tumult that keeps things on edge.